I went in expecting similarities to something like last year's Oscar winner "The Cove" in terms of documentary, but from "Nénette," what I received was something much quieter, drier and bare bones to the point. 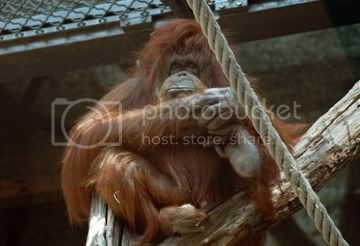 The film opens with a tight close-up of the 40-year-old orangutan Nénette's eyes. The frame then expands to show all of her as she silently observes the spectators passing by her behind a wall of glass. The majority of the shots in the film are these where we are plainly presented a shot of Nénette with the sound of passersby. It's fascinating to wonder what could be going through her mind at any given point, but, just as one of the interviews states, such is pointless as it would produce no conclusive result. There is no voiceover narration and only seldom voiceover interviews throughout the piece. One interview humanizes orangutans in describing how they behave in nature. Another, the most enlightening, comes from the woman who worked as Nénette's first caretaker describing how long it took to get to know this animal. It's all interesting, but in the end we still feel strangely detached from the orangutan like we, too, are only watching her from behind that pane of glass.